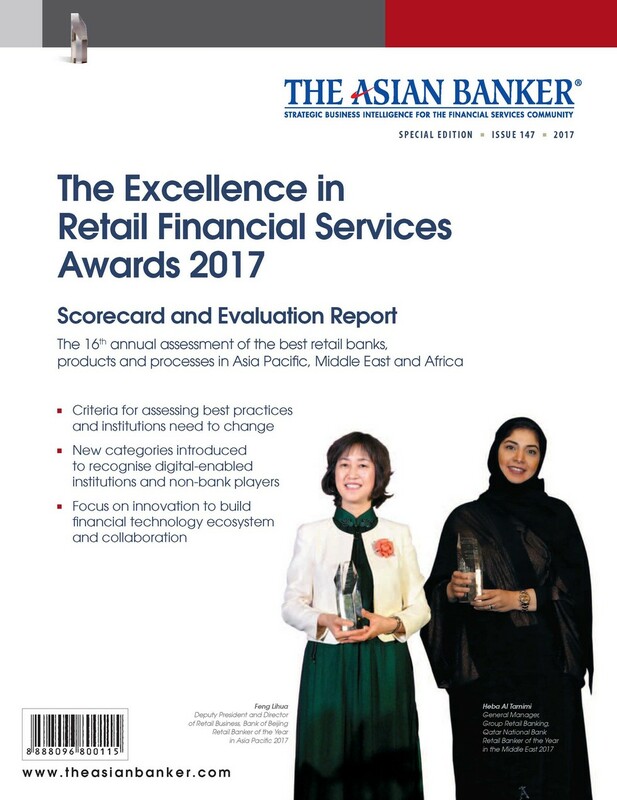 The International Excellence in Retail Financial Services programme is probably the most rigorous, prestigious and transparent awards programme for consumer financial services in the world. At the moment it covers all of the Asia Pacific, home to some of the largest and most competitive retail financial services countries in the world. We also cover the Middle East and West Africa. The programme is being extended to Central Asia, South Africa, the CIS, the Balkans and other areas where retail financial services are important progressively. We already evaluate of more than 300 banks and non-bank retail financial services players in more than 42 countries in a thorough evaluation process every year. The programme also assesses all new players such as payments companies, marketplace platforms and alternative financial services platforms made possible by financial technology (fintech) who are greatly contributing to the transformation of the retail financial services industry. Through this, we aim to capture the evolving competitive landscape and recognise the outstanding players and initiatives, from which the industry can learn from to better provide consumer products, services and experience. Since it started in 2002, the programme has been built on the premise that an outstanding institution in consumer finance demonstrates a long-term sustainable franchise, based on strong business processes that lead to a consistent and profitable performance. It recognises financial institutions for their vision, execution and market leading propositions that make a real impact to their business and the local consumers in an ever transforming industry. In 2015, we took on an audit-based approach in the evaluation process. This involves submissions for evaluation to be completed in a comprehensive data sheet where your basic quantitative figures will be collated and compared with your peers in the industry over multiple years. We also take into account consumers perception surveys. The Asian Banker maintains a comprehensive library of data of all retail financial services institutions in “The Retail Finance Working Group” retailfinance.theasianbanker.com. It contains the profiles of many of the retail financial services institutions we cover, including data, trends, case studies and interviews. It also incorporates templates and assertions that are rigorously tested and used to benchmark the industry worldwide. “The Retail Finance Working Group” is available by subscription. For these reasons, we are able to focus on the changes in the yearly review very quickly without losing sight of the detailed profiles that define each player. We have developed a methodology to track and rate financial institutions on their journey to become highly competitive digital players. From 2018, we have added an assessment of how prepared a player is to compete in the digital world. Where you are in that journey contributes to our assessment of your organisation as a winning player in the industry today. We are willing to share our findings with institutions that are interested to know where they stand and the GAPS with best practice institutions through our “Mapping Your Digital Journey” consulting services. We benchmark your performance globally. We look at global best practices, no matter where they come from. We truly believe that best practice comes from any part of the world, and we are not caught by any Western bias. We recognise achievements as they occur in any part of the world and contextualise them for what the players achieve in their specific marketplace but explained in a global context. We also assess players who do not participate in our programmes to ensure that the winners selected have been assessed against all their potential peers and competitors. With effect from 2018, all our annual rankings are displayed for both the players and their customers to use as a reference for their own decision making needs. The rankings also display the points scored for each of the criterial in our transparent scorecards. Our rankings are open for consumer and industry comments and feedback. We also publish best practice and case studies of operational excellence. We will never conduct ourselves or put ourselves in a manner that can give anyone in the industry any reasons to doubt the impartiality of the decision making process. The recommendations of our researchers and the final decisions of the Council of Advisors are made independently without fear or favour of any commercial arrangements or external factors that can affect their decision. If there are errors in the evaluation process, we are open to criticism and correction by all parties in an impartial manner. We make a clear distinction between the commercial aspects of running an awards programme which go towards underwriting the costs of the researchers and the time involved, and the neutrality with which our researchers make their decisions. The entire enquiry process in the awards programmes is thorough and non- discriminatory. With this approach, we have discovered best practices in institutions that we have never had any forms of interactions in the past. We then initiate an enquiry process to discover new winners who may not be aware of this programme. The process is run on a neutral basis, and we make no distinction between institutions with which we have a commercial relationship and those that we do not. We conduct our research to identify the best possible candidates for the respective awards in a rigorous manner. In the conduct of our research, we do not accept any forms of gratuity, including transport, food, or conveniences and allowances of any kind from any of the institutions that we make an enquiry on. We undertake our own cost in travelling and communicating with all the different players. The sales team in The Asian Banker has no influence in the selection process whatsoever. Although we have many instances where institutions make representation to the sales team ahead of the award process,there are strict "Chinese walls" with the research and editorial teams, where none of these information is communicated and least of all influence the decision making process. The sales team only becomes aware of the winners after the list is approved by the Council of Advisors and communicated to the winning institutions. The list is final and no amendments are made based on any commercial arrangements that arise thereafter. Winning institutions are encouraged by the sales team to participate in commercial activities, most of which goes to underwrite the costs involved in conducting the research. The evaluation process often takes between four to six months of time and work. During this period, none of the independent activities are paid for by any institutions whatsoever. We also do not accept sponsorships that can unduly influence the type of winners being selected. The commercial arrangements that winning institutions are invited to make with the sales team after the announcements are made are designed to add value to the winning institutions’ own marketing efforts as a result of winning the awards in a tasteful and relevant manner. They are also designed to create and sustain the community element that is required to bring the entire industry together, which in turn, adds to the prestige and recognition of these awards. We regret that we cannot allow the intellectual property and rights to promote the win to be used by institutions that do not support us commercially after winning an award. There are institutions that want to promote the fact that they had won an award from The Asian Banker who have not supported us in any way, and we believe that this is not fair to those who understand the process and do support us. We want the industry to take the awards presented by the Asian Banker as the most prestigious recognition of their work as well as professional careers. Any allegations of impropriety or lack of impartiality are taken seriously and brought to the attention of the Council of Advisors for their decision. If there is a need, we will publish allegations of our own impropriety with a view to clarify or correct our position, if the need arises. We stand to be corrected and welcome all feedback because of this position.